This is Ewen Chia and thanks for visiting and reading this article I wrote for you. First, as a quick introduction, I’ve been marketing online since 1997. 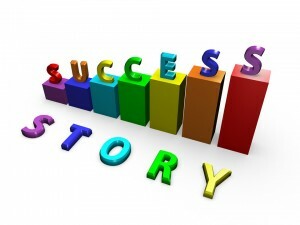 Over the years I’ve personally helped thousands of students achieve real success on the internet. 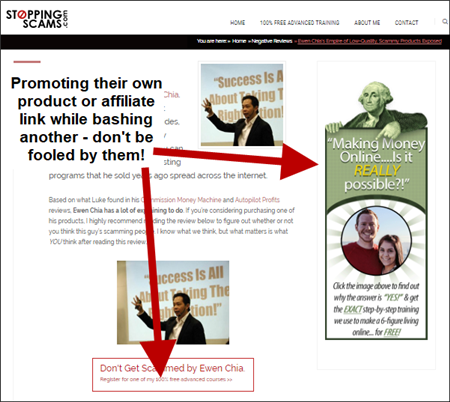 I’m also well-known as “The World’s #1 Super Affiliate” and the author of the #1 international bestselling book, “How I Made My First Million On The Internet…And How You Can Too!”. One of the skills I’m best known for is “Affiliate Marketing”, the business model of making commissions through the marketing and selling of other companies’ products and services. It’s with Affiliate Marketing in mind that I’m writing this article, which is long overdue in my opinion. Have you ever searched the search engines and saw websites ranking for “author name + scam”, “author name + product name” or “product name reviews” etc.? 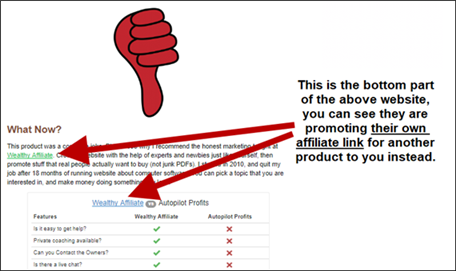 This is an affiliate marketing strategy known as “Fake Reviews”. It involves the websites or web pages writing largely fake and biased negative reviews of a person or product, while promoting themselves or their chosen products. Meaning, they are actually doing all this to MAKE MONEY from another product (product B) while tearing down the competitor’s product (product A). It happens everywhere, not only in the Internet Marketing niche. It’s a strategy that works as many people are misled by and fall for these “reviews”. So they keep appearing and continuing. Most of these website owners also tend to target popular brands and products – simply because there’s traffic from people searching for them. 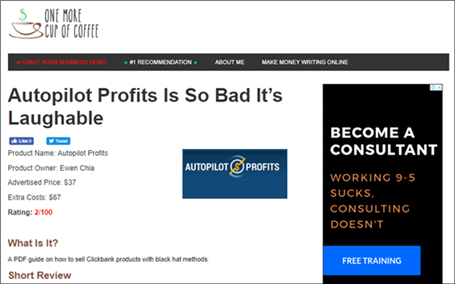 These websites are all manipulating you by using FAKE REVIEWS to profit from you – beware of them! Fake reviews are often targeted at popular gurus, brands and products because they have huge traffic and search volume, ie. demand. In fact, this is the only way the strategy can be effective. If someone is bashing a product or products unfairly, only to recommend another “better” product that he or she is making a commission on, then it’s likely a fake review. Some of these website owners also go as far as to promote themselves as a more credible and trustworthy alternative, as the other guru or brand is seen in a bad light based on their “reviews”. As mentioned, the way this works is by targeting popular keywords that describe their competitors’ names and products. They then try to rank for these multiple keywords on the search engines to get traffic. Think about it, why would another website try so hard to rank and get traffic for OTHER people’s names and product names on the search engines? They should be ranking their own names and products! The very fact they do this shows you they are using fake reviews as a strategy to make money. Hope this article will give you a deeper insight and clearer perspective when you next look at a review! 3 Awesome Tools That You Can Use For Your Market Research! Before you start building your online business, it is very important to do your research carefully. A lot of newbies just jump into the market that they think will allow them to profit. That is ONE BIG Mistake that you need to avoid. You need to lay a strong foundation for your online business by doing a thorough research for the market that you like to go into. Here are some of the tools that that you can rely on. This is a must have tool that is free. All you need is to have a Google Account. It had been updated recently and the search volume is now presented in ranges instead. *Tip: If you are signing in to AdWords for the first time, it will ask you for credit cards details, assuming that you are going to use AdWords for advertising. 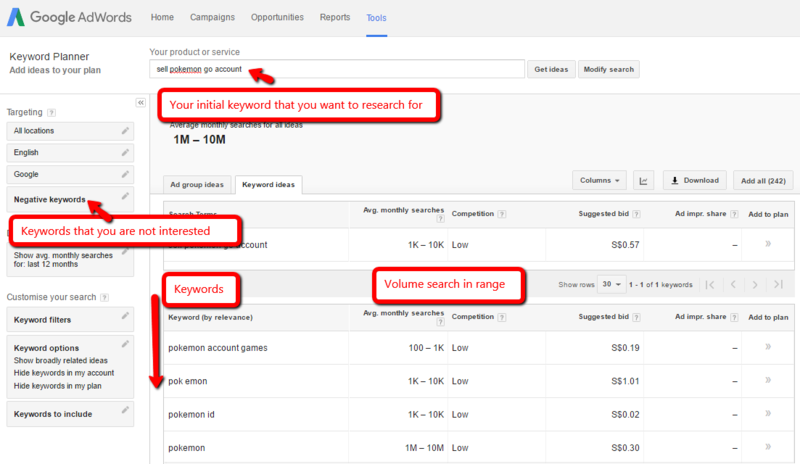 You can skip these steps and go straight to “Tools” and go to keyword planner straight. Ubersuggest is a very interesting keyword tool that search for autocomplete and autosuggest behavior. You can search keyword based on Web, Images, Shopping, YouTube and News and location. It gives you a pretty good idea what people are searching for if you do not know where to start. For example, I searched for “How to” based on YouTube and in United States. 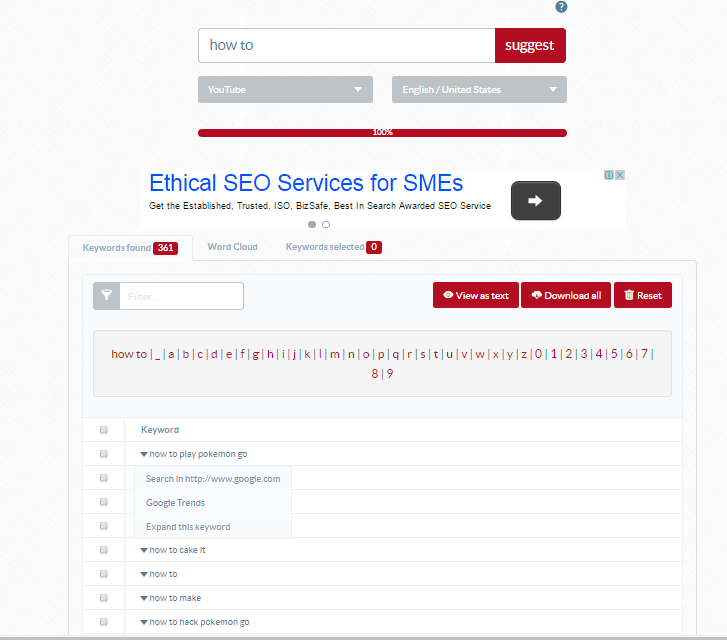 It generated a list of keywords and after that you can do a further research on the keyword that interests you. That’s right! Facebook actually has a very extensive search function. 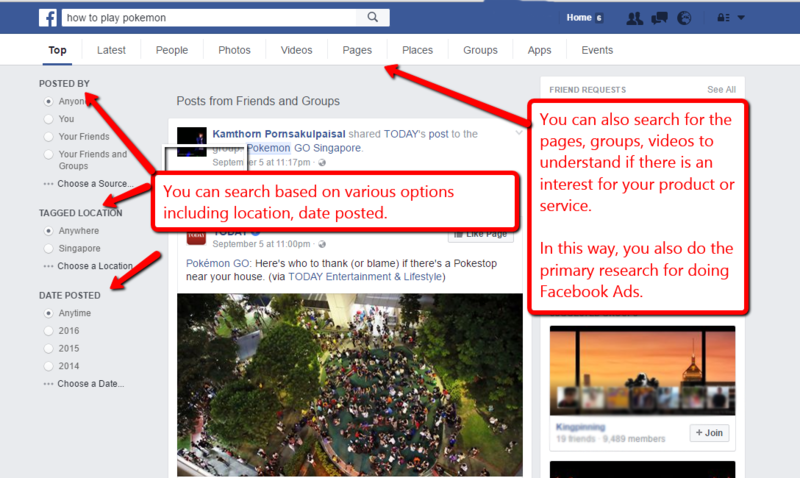 This is especially important if you intend to use Facebook Ads to promote your business. Hence, you need to know if there is a demand or interest in the product or service that you are offering. For example, you can search for “How to play pokemon” if you are selling pokemon related products and discover if there are any groups or fanpage that you can target at. I hope that you are able to make use of the 3 tools that I have recommended above. 7 Strategies To Create Great Content! Firstly, blogs have “evolved” over time. In the past, it gained popularity when many people started using blogs as their personal online journal. After that, it transited into a more organizational use and many people started using them for business purposes as well. However, I feel that “real blogs” are meant to be more personal in both presentation and approach, with a less corporate feel. Blogging is about sharing your passions and thoughts, and at the same time, monetizing the platform too so you can make money. Hence, I usually encourage my students to use blogs as a platform to start their online business as it is simple, personal and very easy to start with. However, it’s all about consistency and to be able to blog continuously is not an easy task. This is especially so if you’ve a day job and busy schedule. You also need to ensure that what you’re blogging about have an impact. Meaning, it has a purpose, quality and hopefully, highly informational and educational. Fact is, if your blog’s content is not too good, it just reflects negatively on yourself. Lets look at 7 simple strategies to do just that! You can do review type blog post. Most of the time, you will be doing a product review. This can be applied to many things, from reviewing food which you commonly see on food blogs (which are very popular) to reviewing a movie you’ve just watched, to a software that you’re promoting. As you can tell, there are many different topics and options to choose from. Most importantly, talk about a topic you like and have a passion for! Within the review post, you can summarize the overall benefits of the product and discuss what you like or dislike. You can also include thoughts about how the experience or product can be improved. “How to tutorials” posts are very popular these days. This is because it can be very valuable to the readers, especially when they get to learn about a topic they are seeking information on. “How to tutorials” posts usually provide step-by-step guidelines on how a topic works or how to do a specific task. For example, a post about how to upload website files onto the internet using FTP, or a post about how to use Excel. Again, most times you can then recommend a relevant product or service (your own or affiliate product) as a complete solution to the readers. This way you get to monetize your content! Another popular type of blog post content you can create is videos. Video is simply another content format, which can sometimes be easier than writing and typing. You can also record a personal video to discuss, comment about a topic or teach something. A good idea is to do a “how to video tutorial” instead which is more effective in terms of presentation than text. For example, it can be an on screen capture type of video to do a specific task, or you speaking over a powerpoint presentation and recording it. 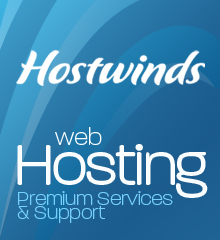 Both methods can be done with software tools like Camtasia or Camstudio. Share your own personal experiences are one of the best types of blog post you can create. Again, it can be very varied on different topics. Just be careful what you say though, especially if it’s something controversial or illegal. What I’m recommending though is to share your personal experiences on an educational topic instead. For example, what I do is share my own internet business experiences, successes and mistakes so that others can learn too. Sharing your personal experiences will also add a huge human touch to your blog and cultivate a deeper relationship with your readers. You can also blog about industry news and articles. This can easily be done by sharing news and content from authoritative websites in your niche, giving credit to the source at the end. For example, if your business is about social media, you can look out for the latest updates on Facebook and share them with your readers. This saves people time and effort. I know we’re all lazy so besides coming up with your own content, you can share other people’s content! This is very similar to the previous strategy but for this specific strategy, you would also want to add your own opinions and tips as an “add on”. One of the most popular blogging strategy is to blog about current trends in your topic or niche. People get excited about trends and they also want to be updated constantly and always be “in the know”. Businesses and individuals are also riding on such trends by leveraging them for content, videos and more. I hope you enjoyed, and most importantly, benefited from this content!